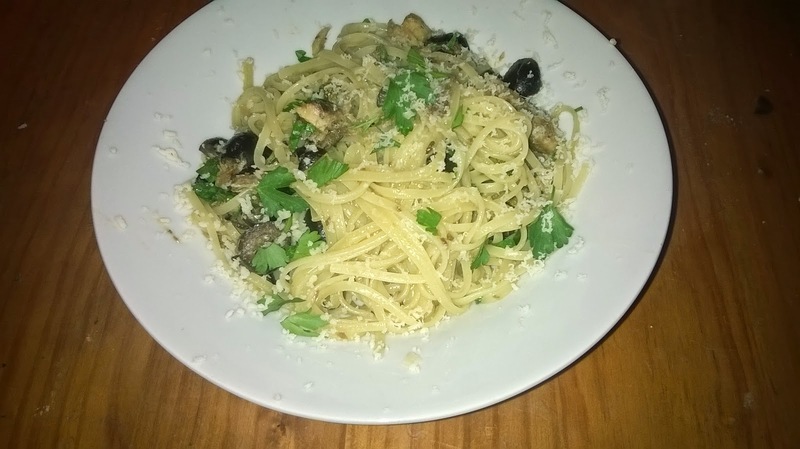 This recipe shamelessly rips off all of the flavours of a traditional tapenade and turns them into a chunky, punchy sauce to go with beautiful linguine. It’s important to use a good quality olive oil for this because without this base the flavours won’t carry so well. I used Olive Branch extra virgin olive oil – it’s the best I’ve tasted. This recipe will serve at least 4, and takes about 15-20 minutes to make. 1. Put the lingune on to cook according to the packet instructions. 2. Heat the olive oil in a large frying pan over a medium heat. Add the anchovies and allow to sizzle away. The anchovies will melt and break down very quickly – after a couple of minutes. 3. Drain the jar of olives and chop them roughly, then add to the frying pan along with the capers and sardines. Break the sardine fillets up a little with your wooden spoon. 4. Add the white wine and let it reduce down for 5 minutes. 5. Add lemon juice (and black pepper) to taste. You shouldn’t need to add any extra salt. 6. Turn the heat off and stir in the parsley. 7. When the linguine is cooked, drain and add to the sauce. Mix together well. Serve topped with a generous pinch of parmesan.